Unfortunately I will be unable to fullfill any orders for the next few months. 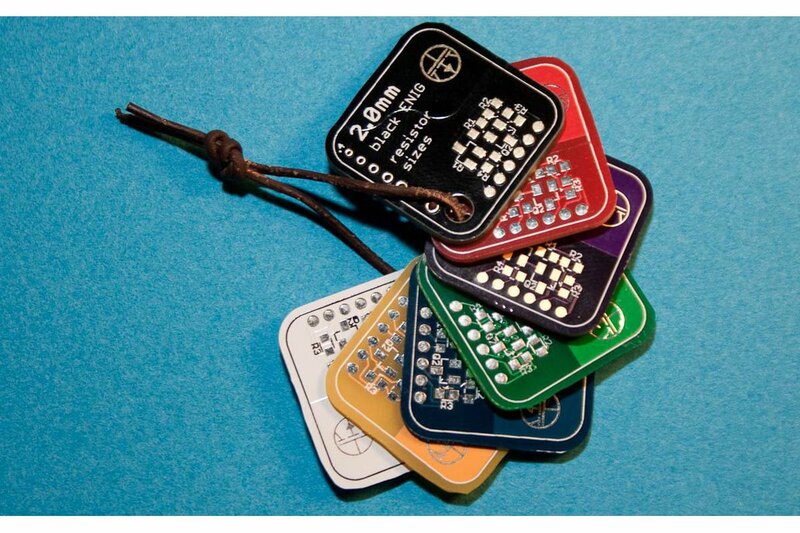 This is a set of seven small (2.2 cm x 2.2 cm / 0.9 in x 0.9 in) circuit boards, in seven different colors and six different thicknesses. The circuit boards also have some useful examples off common PCB design situations on the reverse side. The front of each sample has a short description of the board and a small example circuit. On the side is row of 6 plated holes ranging from 0.4 mm to 1.0 mm in diameter. The white board is 0.6 mm thick, has a HASL finish and the back of the board contains examples of different silkscreen line widths. The yellow board is 0.8 mm thick with a HASL finish and examples of different silkscreen font sizes on the back. The ratio between the font height and the line strength is 8%. The blue board is 1.0 mm thick with a HASL finish and the back side is similar to the yellow board except for a ratio of 15% between font height and line strength. The green board is 1.2 mm thick with a HASL finish and the back contains different examples of silkscreen text. The purple board is 1.6 mm thick with an ENIG finish. The reverse side has examples of different lead pitches and two BGA grids with 1.0 mm pitch and 0.5 mm pitch. The red board is also 1.6 mm thick, with a HASL finish. The back contains footprints for different common SMD diode packages. The black board is 2.0 mm thick with an ENIG finish. On the reverse side are the most common sizes for surface mount resistors, capacitors and inductors. One the left side are suitable landing patters, while the silkscreen on the right shows the actual component size. Since most of the boards are separated out of a larger panel, two of the sides can be a bit uneven or show toolmarks (see images). 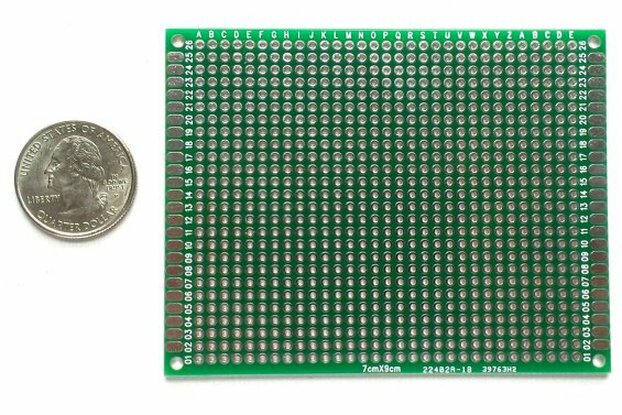 Please do not expect these boards to be exactly 22.5 mm wide and long. Due to the production method some of the boards can also contain an additional panel number. This number will not obscure any other information on the board, and at most two out of the seven boards in each order will have one. You can get a slightly more detailed description and all the design files on my homepage. Great PCB color guide, great component and text size guide. The binding cord to tie them together is a really nice touch. This is a great little reference set, it now has a nice home in my desk, only an arm's length away. Thanks a lot! These look amazing! Received in two weeks. All things are nicely put, and with a ribbon. Thank you buddy. It's one thing to have "rules of thumb" in your head - and to have some laser-printed examples of footprints - but there's no substitute for the real thing, and this collection of PCB 'coupons' is a terrific quick-reference of PCB thicknesses, colors, finish, text (copper and silkscreen), and footprints. If there is a new revision or companion set to this product, I would suggest that an 01005 resistor footprint be added, just to show how ridiculous they are (but perhaps that's 'unmanufacturable' with any reasonably priced board houses), and having some of the PTH examples be in imperial units, and also some NPTH again as references, edge-plating, castellations, and slots would also be a nice addition to be able to show them to people. Fantastic product. A must-have in my mind. This sample set offers a nice variety of different PCBs for reference. Definitely a recommendation! Excellent reference for various sizes, thicknesses, colors, and scales. This helps remind me if I choose 0603 size resistors, I'm asking for trouble. Exactly as described. Fast shipment. Thank you for this useful product. Now I can decide easier on the color of the PCB. Also there are good reference designs on them. Really neat little reference, I planned to use it as a keychain, but I decided it's too useful to get scratched up and broken. Great to actually see the real sizes of lines, pitches, and look of fonts. Recommended. 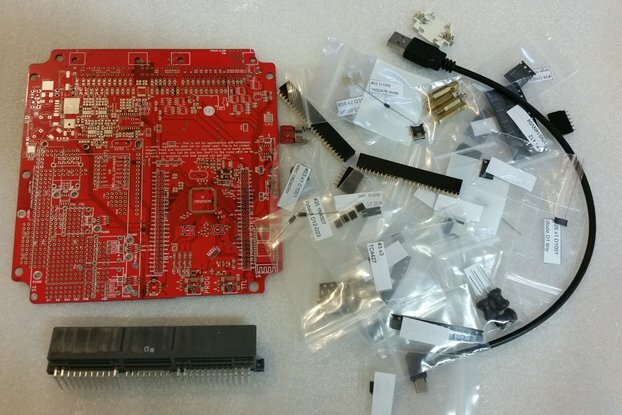 It is great little kit that is handy for amateur PCB designers. The most useful is pitches for ICs and components footprints. Also due to the fact that everything was ordered though 3 most popular PCB fab houses yo can see the quality of each material/finish. Great job! This product is brilliant, the quality and finish are great, and the packaging very good. TBH I wasn't expecting much for this but WOW was I surprised! The set arrived neatly packed from Germany to the UK in just 3 days (from date posted). Its a great little set and really useful for identifying SMD component sizes and for referring to when putting a PCB design together to help you pick the right methods, package sizes and to help you visualize what your designs will look like on a finished PCB. All 7 boards are really well made and have obviously had alot of time put into the design and a very good quality PCB fab used to make them. I have already used this set several times for checking various things on designs I am working on and for double checking componant sizes and packages on boards I haven't designed, that have limited reference material that I am populating. 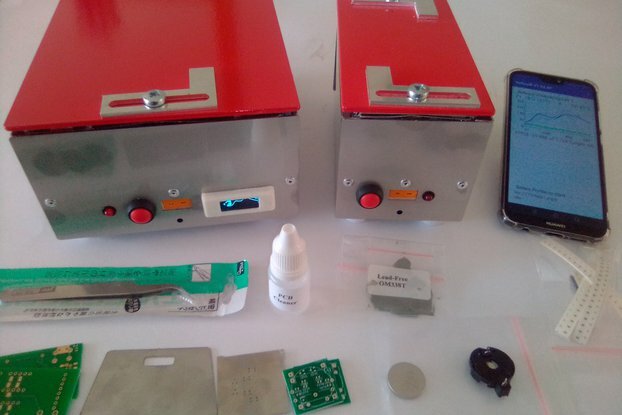 For me it has become an essential and seriously useful set of tools for PCB design and for population. Beautiful and unique set of reference boards. They give a pretty good idea of what to expect when deciding my own board thickness, color, common footprints, silkscreen text/lines and vias. Excellent finish! Pretty nice set of small boards to give you a better idea for color and finishing options - goes great with the more feature-complete single-board type reference PCBs (e.g. SparkFun's PRT-0875 - although that could use an update), and it was only $10! Looks like it's sold out and already 44 more people want it. What are you waiting for - add yourself to that list! Seven different postage stamp sized PCB's each demonstrating one of the optional colour, with text, pads, lines ranging across the boards. In addition to this boards from 0.6mm to 2.0mm are here too. Really useful if you want something different as your stamp on your boards. Great product that made me finally understand the differences in PCB thickness, and finish (HASL, ENIG..) and see all the pcb colours. Looks neat too. I'm much more confident when making PCB production options now.